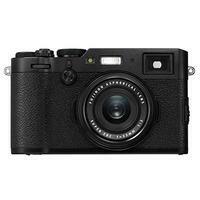 The Fuji X100F in black is the fourth-generation in the X-Series range of premium compact cameras, featuring a 24.3-megapixel X-Trans CMOS III APS-C sensor with no low pass filter, a bright 23mm f/2 lens, Fujis Advanced Hybrid Viewfinder, and enhanced AF performance. Small yet powerful, the X100F delivers the highest level of image quality and mobility in the series, along with the design aesthetics and handling of a classic, retro camera. Li-ion battery NP-W126S, Battery charger BC-W126, Shoulder strap, Lens cap, Metal strap clip, Protective cover, Clip attaching tool, USB cable and Owner,s manual. Fujifilm X100f Excellent Condition Low shutter count, extras.